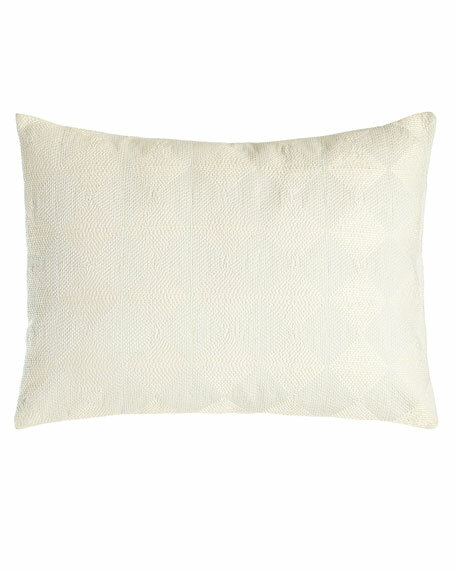 Vera Wang Sti Thread Counthed Concentric Squares Pillow, 12" x 16"
Vera WangSti Thread Counthed Concentric Squares Pillow, 12" x 16"
Austin Horn Classics Embroidered Ivory Florenza Pillow, 18"Sq. Ivory linen. Hand-embroidered floral motif. Feather and down fill. Zip closure. Dry clean. Made in the USA of imported materials. Austin Horn Classics Prestige Pleated Pillow, 18"Sq. EXCLUSIVELY AT NEIMAN MARCUS Pleated pillow is made of polyester. Feather/down insert. 18"Sq. Spot clean. Made in the USA of imported materials. Quilted Egyptian-cotton sateen. 300-thread-count. Feather insert included. 21" x 37". Machine wash. Made in the USA of fabric woven in Italy. Pyar & Co. Brava Pillow, 18"Sq. Handcrafted of silk. Front has chainmail design with crystal-like accents. Plain, solid-color back. Feather/down insert. 18"Sq. Spot clean. Imported.